UPDATED: Wed., July 11, 2018, 4:53 p.m. 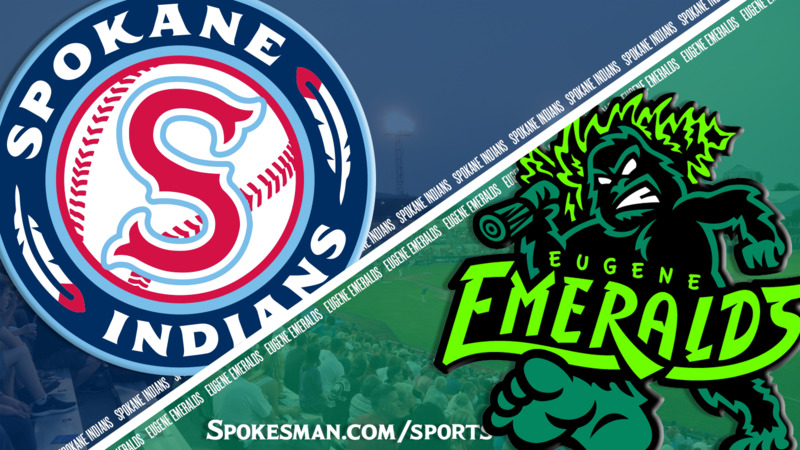 The Spokane Indians (8-17) take on the Eugene Emeralds (9-16) in the first of a five-game Northwest League series at Avista Stadium at 6:30 p.m. The Indians are five games back of North Division leaders Tri-City and Vancouver with 13 games to play in the first half. Spokane has lost its last four and fell to 0-11 on the road with Monday’s loss at Vancouver. “Tri-City we coulda, shoulda, woulda took two out of three,” manager Kenny Holmberg said of the road struggles. “Hillsboro we could have taken two out of five. Had two walk-offs there. Tri-City we had the extra-inning game and we had to throw a position player. Last game there (Jake) Latz started we just couldn’t finish it off. “Vancouver, it’s a tough place to go and play,” he continued. “I think it was a good environment for us to learn, especially these guys that haven’t played in front of an environment like that. Indians lefty Jake Latz (1-1, 4.50) faces RHP Derek Casey (0-0, 0.00) tonight. Fresh off his first win of the season, Latz is making his fifth start of the season. Last Wednesday, the lefty went five innings and allowed two runs on six hits and a walk with four strikeouts. Casey, the Chicago Cubs ninth-round pick in the 2018 MLB Draft out of the University of Virginia, is scheduled to make his pro debut. As a senior at UVa, he finished 7-4 with a 3.48 ERA and 106 strikeouts over 95.2 innings. Lineup: 1) CF J.P. Martinez; 2) 2B Cristian Inoa; 3) 3B Diosbel Arias; 4) LF Jonah McReynolds; 5) 1B Curtis Terry; 6) RF Starling Joseph; 7) DH Troy Dixon; 8) C Scott Kapers; 9) SS Tyler Depreta-Johnson. Player to watch: Curtis Terry continues to lead the NWL in home runs (8), RBIs (21) and slugging (.615). After a hot start with eight homers in his first 15 games, Terry hasn’t gone deep since July 3 and has struck out his last seven at-bats over three games. Eugene top prospects (organization ranks in parenthesis): RHP Jose Albertos (No. 4), OF Nelson Velazquez (No. 9), LHP Brailyn Marquez (No. 26), RHP Paul Richan (second round, 2018). Last game: Christopher Bec delivered a two-run home run and the Vancouver Canadians (13-12) beat the Spokane Indians (8-17) 3-0 in the last of a three-game Northwest League series at Scotiabank Field on Monday. The game was called in the bottom of the sixth inning during the second rain delay. Promotion: For every batter that the Indians strikeout, one lucky fan will win a crisp $100 bill. Immediately after the game a helicopter will drop 2,000 $1 bills and lucky fans will race to see who can collect the most money. Weather: Game time – Sunny, 84. Final out – Clear, 71. Published: July 11, 2018, 4:26 p.m. Updated: July 11, 2018, 4:53 p.m.